This elegant colonial style villa is absolutely amazing and today the homify team will take you on a splendid tour of the spacious 280sqm home situated about 150km outside of Rio de Janeiro, Brazil. The magnificent structure is located in Angrado Reis and is a true paradise on the Costa Verde. The sheer attention to detail and elegant planning that went into creating this desirable home shows the perfect teamwork that was pulled off by the expert team at Escala Architects, making this home a dream living space that's filled with rustic charm and modern elements of simplicity. This view of the magnificent villa shows off the style of the home that is so perfect and modest in all ways. From this garden angle we can clearly see the separation of the downstairs social and living quarters in comparison to the upstairs sleeping areas. The home has an almost island life appeal to it with fantastic greenery taking over the grassy garden, while tall tropical trees tower over the colonial style home from behind. However, the simple use of colour and neutral tones just allows the home to blend in so well with the vegetation. The downstairs veranda area will make for a perfect social space, while the garden can be converted into an outdoor party area for those large family gatherings. This living room reflects the outdoor style of this home perfectly with simple use of colour and natural tones as well as the white walls that has made the exterior of the home look so perfect. 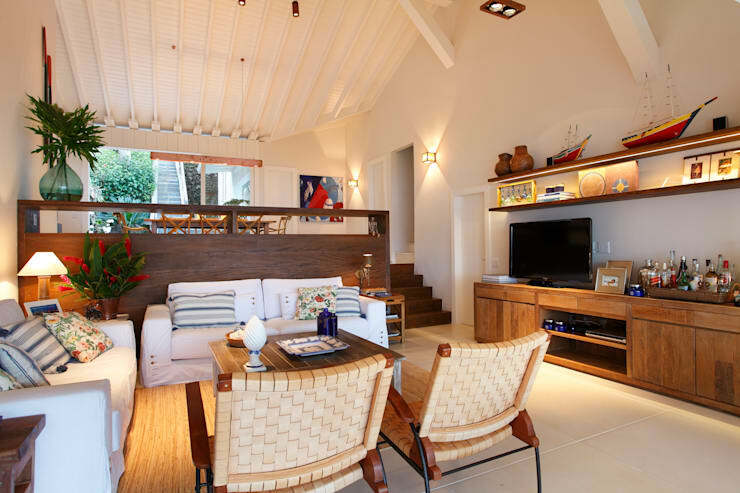 The furniture and decor of this amazing villa allows the home to come alive with natural colours. Throughout this home wood seems to be the dominant material and element, and with so many shades, textures and types to choose from the wooden aspect of this home adds a dimension of stunning style and colour to this interior. The floor to ceiling white walls creates an illusion of an even larger living room space that remains cosy and inviting regardless of the season! The dining room of this inspired colonial style home is simple and uncluttered with enough ventilation that provides for a perfect outdoor communication experience. The simple all white walls adds a perfect finish, creating a harmonious dining experience that is open and honest. The white beamed ceiling once again creates that island life illusion. While the solid wooden dining room table adds a rustic element to the room, wood seems to play an important role in the décor of this space too, with the wooden sideboard adding a décor element. Behind the dining room table is the wooden staircase that is the gateway to the upper level of the home. The stunning blue wall contrasts quite well with the wooden stairs and just adds a different effect compared to the all-white walls seen in the rest of this beautiful home. For more dining room ideas, you might like to check out: How To Dine In Style: Your Perfect Dining Room. A simple yet contemporary bathroom such as this creates that element of beauty and wonder in the interior of the home space within its most private areas. And a bathroom that matches the colonial inspiration and rustic elements of the rest of the home makes perfect sense! The all-white walls and shower area creates the best effect in simplicity. It's timeless and classic approach to modern living and with these contemporary and stylish fixtures you can definitely not go wrong. 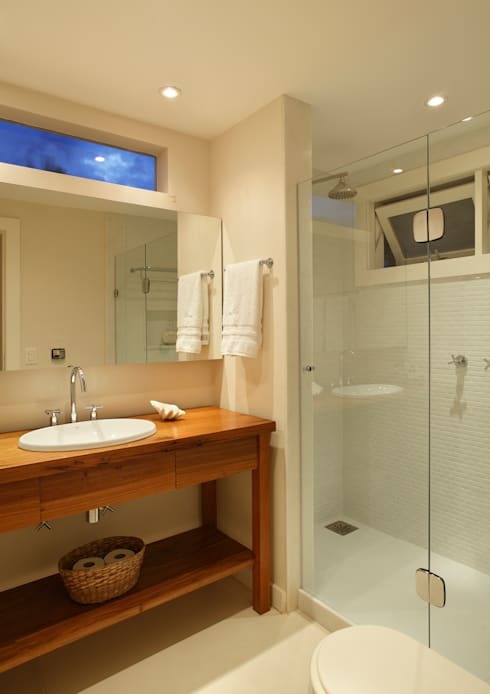 The bathroom has enough natural ventilation through the addition of windows in the shower and bathroom to allow for a clean environment too. Do you need some more bathroom ideas? Have a look at the compilation on homify for some creative features and projects! This is another look at the garden and veranda area of the beautifully inspired colonial style home, just stare for a moment and take in the sheer elegance and style of this contemporary yet retro living space with all the finishes of a majestic modern home. On closer inspection the veranda that surrounds the entire downstairs space allows for natural sunlight to become part of the interior decor throughout this home. The swimming pool makes the perfect addition for those days when the scorching sun just means that a jump into the cool blue water is all that can cool off the mind, body and soul. The garden space of this beautiful home has captured vintage style living perfectly! 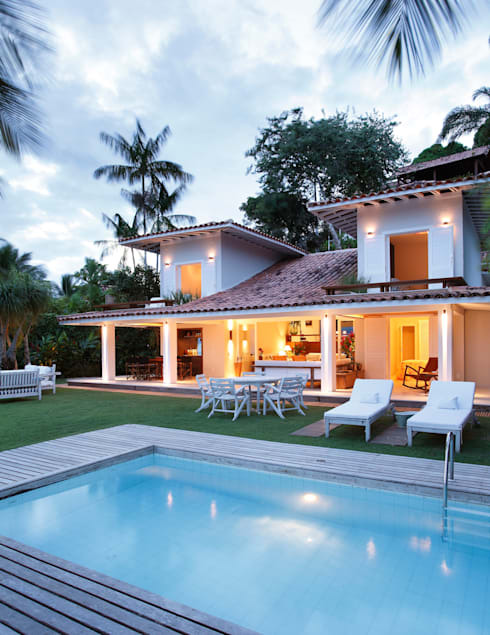 We end our tour of this charming Brazilian villa today with a look at the sea views that this inspirational home seems to show off at every perspective, from the upstairs bedrooms, the veranda and even the garden. This spectacular ocean sight is simply amazing to see at any time of the day and regardless of the season. It's like having your own private beach that looks so stunning and picturesque while being a view that is visible from the comfort of your own home. 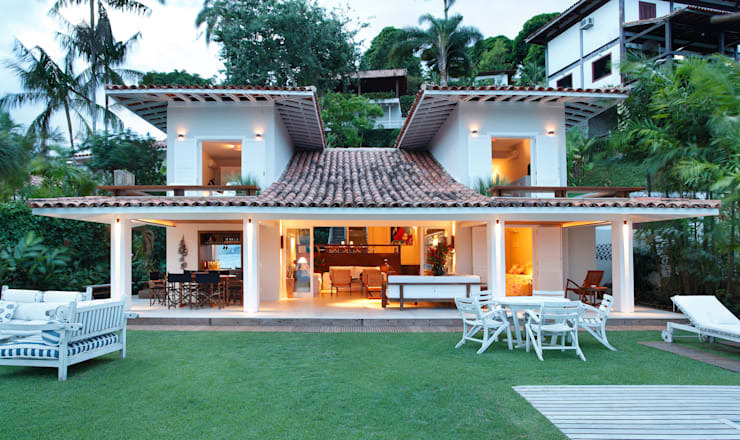 This Brazilian masterpiece home really takes that island living effect to the next level. 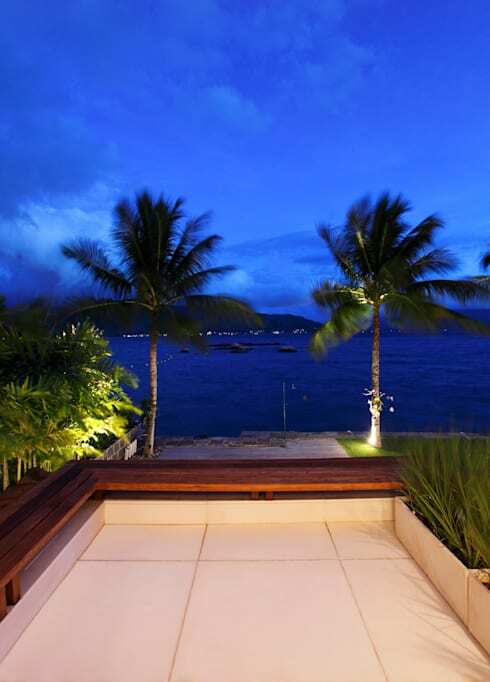 Who wouldn't want to enjoy this view at any time of the day and relax while taking in the sights and sounds of the waves crashing against the shore. It was love at first sight for us with this home! Did you feel the same?